Our detailed and expansive urban ecology study of New Orleans is now out in Ecosphere, the journal of the Ecology Society of America (ESA). Lead by Joshua Lewis this is an excellent example of an interdisciplinary research effort that blends natural science and social science with historical interpretations. This is the first article among others that we will publish from this empirical study, which has been long in the making and with a comparative dimension to our Cape Town study within the MOVE project. Post-disaster ecology is as much about social injustice as it is about ‘weeds’ growing unevenly across the urban landscape. Our study of New Orleans demonstrates that social class, race and the uneven response from planning authorities have had effect on the re-organization of urban ecosystems. 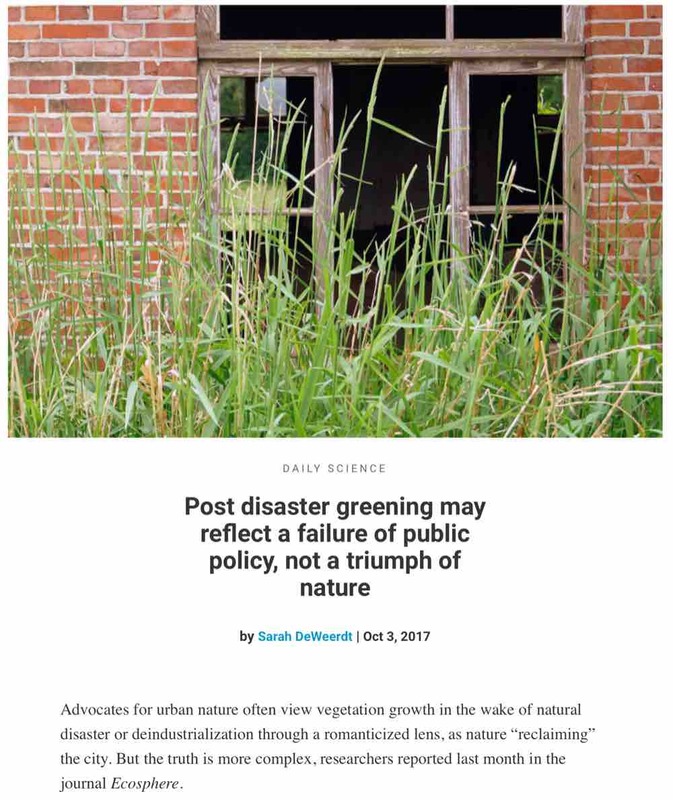 To great credit, it’s a pleasure to see that the article has already been picked up and featured by the Anthropocene Magazine, published by Future Earth, in an article by Sarah DeWeerdt called “Post disaster greening may reflect a failure of public policy, not a triumph of nature” (3 Oct 2017). The Stockholm Resilience Centre has also highlighted this MOVE-project article in their “The weeds are thicker on the poorer side of town”. These articles summarises the gist of the article, but if you like to read it in full, it is published Open Access in Ecosphere. Our new paper in Ecosphere on New Orleans was featured in the Anthropocene Magazine on 3 Oct 2017.